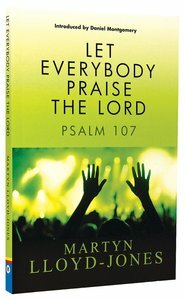 About "Let Everybody Praise the Lord: Psalm 107"
Born in Cardiff, Dr Martyn Lloyd-Jones (1899-1981) was a practicing physician until leaving medicine to become the minister of a Welsh Presbyterian Church. Minister of Westminster Chapel and co-founder of both InterVarsity Fellowship and the Banner of Truth Trust, this brilliant Welshman was arguably the greatest evangelical preacher of the 20th century. Best remembered for the power of his sermons in an age of spiritual decline and apathy, Dr Lloyd-Jones exercised his formidable intellect in the service of a thoroughly biblical faith, inspiring his contemporaries to think through the implications of their beliefs for both Church and world. Dr Lloyd-Jones never tired of calling the Church to revival, to foundational doctrines and to a prayerful zeal for authentic apostolic experience. His rich legacy of recorded and published sermons continues to be used by God to transform lives today.